OK, we’ll let the parents come, too! 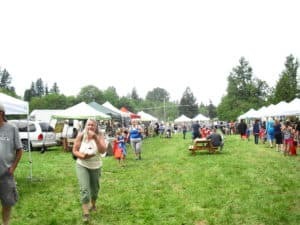 But, each year at the the Yelm Farmers Market we are so pleased to see the number of kids who come out to learn more about food and farmers and buy good things to eat or to just look around. This year in our new location at the Yelm Community Center on the Yelm City Park, kids can also get to the park playground easily and spend time looking around the new Community Garden which will be right next door. The Yelm Farmers Market is a place for families and we hope to see you all there! Bounty for Families presents the Yelm Community Garden program! The first one will be located in the Yelm City Park by the Community Center – look for groundbreaking soon! The garden will not just be your everyday garden either. The borders will be living! Imagine a “fence” made out of living plants that can be harvested. Between the parking lot and the garden will be apple and cherry trees growing horizontally so that they make a border low enough the fruit can be picked by your kids! The short ends of the garden will have borders of red and green grapes and the border between the garden and the city park will be annuals. In the garden, you’ll have the chance to help plant, help maintain and help harvest more fruits, vegetables and flowers! 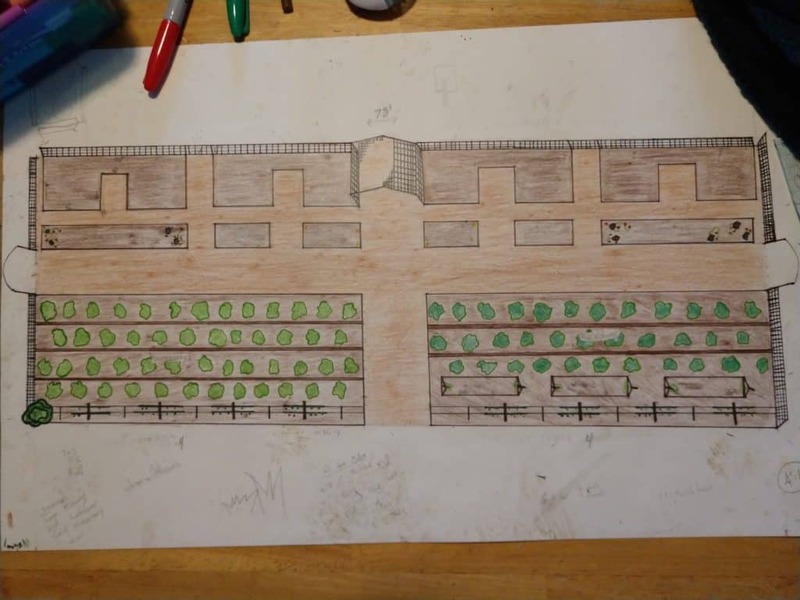 The sketch below is of the basic layout of the garden. First planting is planned for March 2018 and will continue as needed. We want the community involved – this is your garden – and you can do that with your time, or your building expertise and/or donations of materials, plants and even cash! 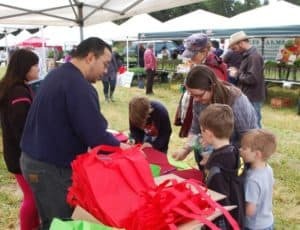 Once more, the Nisqually Indian Tribe (http://www.nisqually-nsn.gov/) has shown their commitment to supporting Yelm community activities by sponsoring our Power of Produce Kids Club (http://bountyforfamilies.org/our-programs/power-of-produce-kids-club/) for another year. The 2018 sponsorship of $6,000 should fund the program throughout the entire market season this year! The Power of Produce Kids Club introduces children to fruit, vegetables, and the farmers who grow them while developing financial literacy skills (and perhaps a bit of patience). The free club is open to children ages 5 to 12. Once they’ve enrolled, they’re given a badge and a small shopping bag and each week when they register, they receive two dollars of market tokens that they can spend on fruit or vegetables or a plant that grows food. 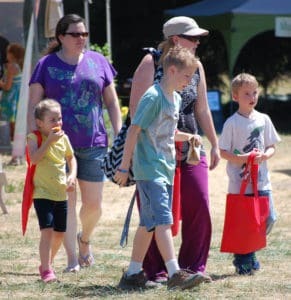 Since the Club was begun at the Yelm Farmers Market (yelmfarmersmarket.com) nearly 1,600 children have enrolled and made over 4,000 visits to the market. Each time they come, we hope, they learn a bit more about our food supply and how valuable our farmers are. Make sure you enroll your kids again this year at our new location in the Yelm Community Center at 301 2nd Ave in Yelm. In November 2017, Yelm Farmers Market vendors met with members of the BFF Board proposing the establishment of a market committee. This committee would be made up of vendors, other interested parties and members of the BFF Board. On Dec 5th, a visioning session is being held to create the blueprint for how the market will operate in 2018, how the committee will operate and the role of the BFF Board. Assisting us will be Mary DeMatteo, the Regional Lead of the Washington State Farmers Market Association (WSFMA) who is responsible for Thurston County among others. Discussions are focused on the management of the market for 2018. Should this continue to be a market manager managed market? Should it be a vendor operation market? Should it be some combination of the two? This process is a reinventing one to make sure that the Yelm Farmers Market is a strong viable community presence for a long time to come! Calling all Yelm Farmers Market Vendors! We are considering changing the meeting scheduled for Sunday, Nov 12th to a Thursday evening later in the month. This meeting is an important one since we want to set up the YFM Committee so work can begin for 2018. This message is also posted on the Yelm Farmers Market Facebook page – please reply there if a Thursday evening is good for you. You will also be receiving an email today and you can reply to that as well. Hope to see as many of you as possible this month! Power of Produce 2017 – Another Success! 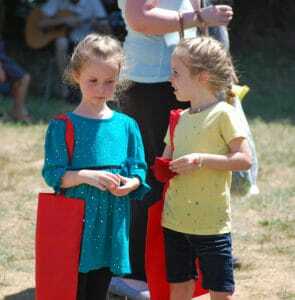 This year again, the Bounty for Families Power of Produce Club, held at the Yelm Farmers Market, was a great success. 443 kids were enrolled this year, just down from 485 last year, to make the grand total since the program began in 2015 1,587 kids! And they come back over and over again during the season so that our total so far is 4,059 visits. That’s over 4,000 times that young people, aged 5-12, were at the market interacting with local farmers and growers, learning about food and healthy choices and taking home veggie starts for their own home gardens. What an education these kids get! There is, however, one challenge with this program: it has to be fully sponsored or receive grant money or donations since the $2’s worth of tokens given to the vendors must be reimbursed by the market. This year, unfortunately, we had to stop the program mid-August since the funds we had ran out. So for this program to continue educating our young people, some of your sons and daughters, we need your support. In 2018 we will make it very easy to help. Our website has a way for you to donate either one time or on a recurring basis. It’s so easy to set up a monthly contribution of $10 or $25 to this really outstanding program by going to http://bountyforfamilies.org/our-programs/power-of-produce-kids-club/ and clicking the “support your BFF’ button on the right hand side. Rather use your mobile device? Just text BFF at 91999. Your donation can make a huge difference – support the Power of Produce Kids Club at the Yelm Farmers Market in 2018. Water Cannon at the Yelm Farmers Market Sept 2nd! Temps in the 90’s on our next Yelm Farmers Market day, Sunday, Sept 2nd and we’ve got a treat for you! Before and after, visit our great vendors and take some farm fresh fruits and vegetables, or some great crafts, home with you! The cannon will be “firing” from 1:00 p.m. to 2:00 p.m. thanks to Glenn Schorno, our host at the Nisqually Springs Farm. P.S. If you’d like Bounty for Families to be able to keep the Yelm Farmers Market going in 2018, you can help by volunteering for lots of different tasks and/or by making a simple recurring donation. 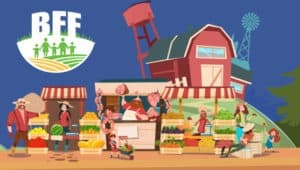 Go here and click on the “Support Your BFF” button: http://bountyforfamilies.org/our-programs/yelm-farmers-market/ …and Thanks!!! 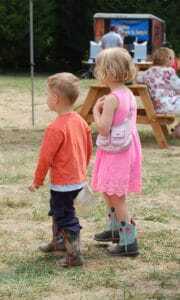 Yelm Farmers Market open until end of Sept! 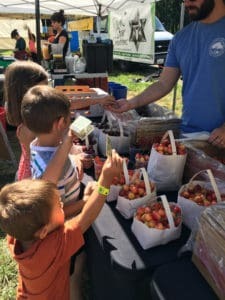 New development: the Yelm Farmers Market will remain open until at least the end of September and NOT close the end of August as earlier reported. The vendors themselves will be coordinating the operation for the remainder of the season. We expect all the vendors to return so come out and get your favorite goodies – lots of produce will be featured at the farmer stands, and all the other great products you’ve come to expect will be there, too! Come support your local farmers market and the vendors – they rock! Watch this space for developments for 2018’s market. The Yelm Farmers Market will end its 2017 season Aug 27th. We have had some great vendors this year who stayed true to the market even though it was smaller this year. We look forward to building 2018 with them and making next year a “reboot” year for the market. Some of those wonderful vendors are Mari’s Farm, Root Cellar Farm, Fardell Farms, Bee Forever, Reed’s Sweet Wine, Rawk Star Creations and Yummy Local Foods. Thanks so much! We have also had awesome sponsors like OBEE Credit Union, Olympia Federal Savings, Yelm Family Medicine, Crowe Law, Timberland Bank and Blue Waters Acupuncture Center. Thank you so much! We are excited that the city administration of Yelm has been so motivated to get us to move back to the city next year. They have adopted all the code change recommendations we submitted to them and now locations are being reviewed to determine if the move from the farm is the right one to make. Power of Produce Kids Club was a success again this year with over 400 members! In this program, each child, aged 5-12, gets 2 $1 tokens each week to spend on fruit, veggies or plant starts. Cashing these tokens in gives the kids a chance to learn from the vendors about the products they are buying. This educational aspect to the market is a really important on for us! Keep checking in with us for details about the Yelm Farmers Market for next year! Thank You Showroom Interior Solutions! Thank You Klein Family Foundation! Thank You Crowe Law Office! Thank You Blue Waters Acupuncture!